(CBS) CBS News royals contributor Victoria Arbiter, reporting from London, will be giving CBSNews.com readers daily updates on plans for the April 29 royal wedding. There's been a lot of talk over the last few days of William's ex-girlfriends who are attending his wedding. I thought it was time we broke down the list to properly understand the inner workings of the glossy posse. The British aristocracy is a strange breed. They move in tight, intimate circles where it's safer to retain a stiff upper lip rather than advertise a broken heart. Once you're out of the circle, there's no getting back in. There can't have been any lip stiffer than that of Andrew Parker-Bowles when he attended the wedding of his ex-wife Camilla to Prince Charles in 2005. So on that note, exactly who are these former flames of Prince William? And should Kate be worried? Bachelorette number one is Jecca Craig. Her real name is Jessica but she's properly posh so goes by Jecca instead. She's known Prince William since they were 16 and the young prince was apparently so smitten with her that when he spent time at her family's Kenyan estate they held a mock engagement. Mock or not, the attraction didn't last long and Jecca has simply remained a close friend of the prince. He has even taken Kate out to Jecca's family estate in Kenya, so it's safe to say the girls are pretty good friends, too. Bachelorette number two is Rose Farquhar. Her father is the Master of the Beaufort Hunt, a supremely popular sport among the hoi-polloi. Rose, an up-and-coming recording artist, and William enjoyed a summer romance after he left Eton in 2000. Perhaps having been childhood friends it was just a little too weird being romantically involved. Rose is probably quite happy to remain just friends with both William and Harry and she does, after all, bring a little pop star chic to the inner circle. Bachelorette number three is Olivia Hunt. She dated William for about a nanosecond while at St. Andrews. When Kate came on the scene the romance fizzled pretty quickly. However, the three have remained good friends and have even enjoyed a skiing holiday together in Klosters. Olivia did go on to date William Van Cutsem, a great friend of the prince's, but that didn't last long, either. It may be time to give the Williams a rest, Olivia. Lastly - and probably most significantly - is bachelorette number four, Arabella Musgrave. 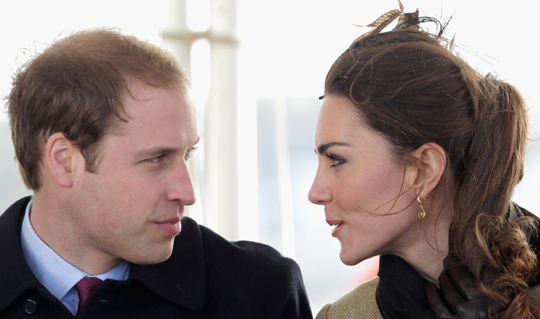 Rumored to be Prince William's only real other love interest, they enjoyed a passionate romance the summer before William went off to St. Andrews. The Van Cutsem brothers pop up a lot within the royal circle and it was at a Van Cutsem house party that the couple first met. Although they agreed to break up when William left for university, the prince still missed her terribly. That is, until one Kate Middleton strutted her stuff down the runway in a barely there see-through dress. The rest, shall we say, is history. Until next time, royalphiles, keep calm and carry on. Keep up with Victoria Arbiter on Twitter.